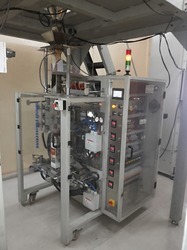 We are one of the very few manufacturers who are making Square Flat bottom Stand up pouch making & packing machines. Combining the advantages of the traditional side gusseted bag along with those of a stand-up pouch makes these a great fit for any product! The flat bottom allows even the lowest density product to sit securely on the shelves without ever worrying about tipping over. Dry Fruits, Whole spices, Tea, Soya nuggets, Pasta, Macaroni, Dry Fish (Bombay Duck & Prawn) & other Granules. Approx. 20- 35 standy pouches per minute. (Also depends upon product to be filled). All Four corner sealing with top gasset & square flat bottom . Ten Head multi weighing filler. Through Clutch & Brake/ Servo Driven. 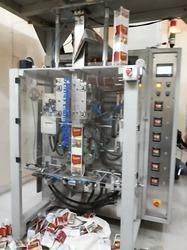 Through pneumatically operated clap type sealing jaws. Microprocessor controlled MMI with PLC (Delta/ Messung/ Siemens Make). Yes (Delta/ Messung/ Siemens make). all four corner sealing with top gasset & square flat standy bottom . 5. 7’’ (color touch screen).